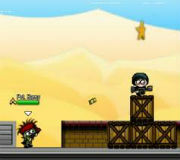 In City Siege 4 Aliens are back and they have kidnapped some of your people. Arm yourself with advanced units and lazer guns and get them back safely. Note: Use the mouse to navigate the menus and manage your army and buy new troops.